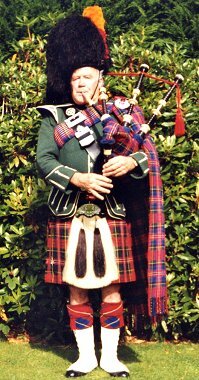 CARRICK has lost one of her best known pipers and a much respected man with the death of George Murdoch. He will be sadly missed by all who knew him, and his talent for teaching will be especially missed by many young pipers. George (75) was well known in local schools for his help at Burns Suppers and other special occasions - and he played at many a local wedding and funeral. Visitors to the area were always keen to be photographed with him, especially if they could 'borrow' his busby. And many of them sent copies of their snaps back to him from all over the world. Sadly, the pipes sounded a lament at George's funeral - played by Kevin McDermott, Pipe Sergeant of Maybole Pipe Band, in a poignant farewell to a much loved and weel kent man. George was born in Ballantrae, but his family moved to Girvan when he was two. His early education was at the now-demolished Douneburn Primary School, where he was Dux in 1938. George left Girvan High School at 14, and worked as a butcher's boy in wartime Girvan. His father drove a milk lorry and George would help him at weekends - cherishing the ambition of becoming a driver himself. He fulfilled this aim, and George's working life included being a bus driver and driving for haulage contractors McKechnie Motors. 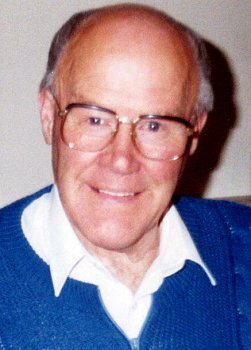 He moved on to work for McGill Bros for the next forty years, and finally for William Pitt and Sons of Girvan until he retired in 1992.